I've gotten some emails over the past couple days wondering if I'm alive and well. Either I'm still alive or this is the coolest trick ever. That being said, I've been busy as all get out. All sewing time has been spent trying to meet some deadlines [and failing, but hey, I'm not bitter or anything]. But the world marches on, I still have a desire to create, and the ladies at my work decided to do a "Sweetheart Swap." I came up with the name, and it makes me smile and cringe at the same time. I am not that kind of girl. But the girl whose name I drew totally is, so I wanted to whip up something super cute for her. No sewing at all. 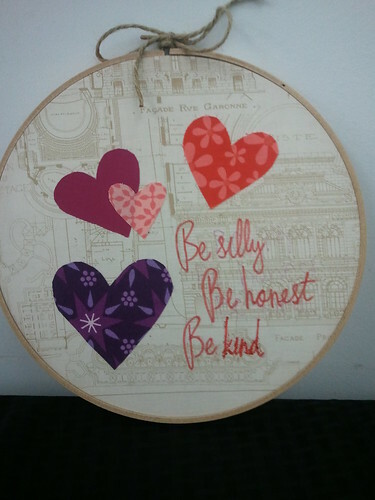 A little Decor Bond, a 9" embroidery hoop, a red marker, and some red glitter glue. PS, my computer hard drive crashed, so I'm trying to salvage pictures of my DQS13 to share! Also, it means it takes me longer to reply to emails and such, since I'm doing everything on my phone. I'm not that kind of girl either, but this is very cute Rebecca. I'm sure your partner will love it! That's such a sweet little project! Lol. Glad you're still with us :) I love your design - simple and to the point! Glad to see you're still around!! I finally got around to posting today after a month too! Does your stash need a little decoration? Click to get the pattern! I'm looking for some quilty soulmates. You may use my work as inspiration, my crafty/sewing photos in your own posts, and may summarize my wordings, but to do so you must credit me [Rebecca @ Sew Festive] and link back to the blog or individual post. You may not claim any of my original works as your own idea, and please do not use any tutorials or patterns for commercial purposes. Also, please do not use any photos of myself or my family without my permission. Essentially, play nice! Thank you. Announcing the Christmas in July Event!